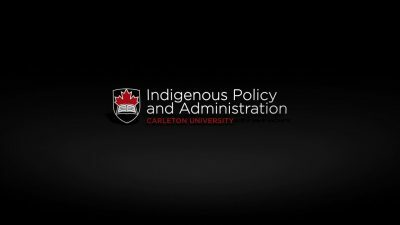 Carleton’s School of Public Policy and Administration (SPPA) offers two unique Graduate Diplomas in Indigenous Policy and Administration (IPA). The goal of these programs is to develop the skills needed by professionals working in or with Indigenous governments and organizations. The programs are designed to provide students with the opportunity to develop cultural and contextual competencies essential to this work: to bridge traditional Indigenous worldviews with others, including those embedded in the practices of governance and administration that are found in general Canadian and international settings; to understand the complexity of First Nations, Métis and Inuit history, politics and contemporary structures; and to develop their skills in financial management, community development, organizational design and leadership. This Diploma will be of interest to individuals who are working in or with Indigenous organizations and governments, or preparing to do so, and who seek relevant graduate level training in policy and administration. This Diploma will be of interest to Carleton students already enrolled in other graduate programs who wish to work in this area. The IPA courses will be delivered through an intensive on-campus IPA Summer Institute, and online. In the first years, they will only be available on a part-time basis, with students able to take one or two courses per semester. Graduates of the IPA Diplomas who are later admitted to the Master of Public Policy and Administration can subsequently use most of their IPA courses toward the MPPA degree. Please note: All Carleton students are welcome in IPA courses offered by the School of Public Policy and Administration (space permitting). The National Capital Region is the natural place for this unique Graduate Diploma in Indigenous Policy and Administration. Ottawa has a significant and fast growing First Nations, Métis and Inuit population. Many national and regional Indigenous organizations are located here. Carleton University offers a variety of services for Indigenous students, including those offered through its Centre for Aboriginal Culture and Education. And the School of Public Policy and Administration has a growing number of active research collaborations with Indigenous communities, governments, and organizations located in the Ottawa-Gatineau area and elsewhere in Canada. **Like us on Facebook at facebook.com/ipa.carleton.